The vehicles were built, concerning the chassis by Brossel, concerning the coachbuilding by Paul D’Heure, the electrical components were made by ACEC. - The first serie was recognizable by the radiator in front of the vehicle and by the mudguards in front of the back wheels. The lateral destination indicators were shorter and installed over the doors. - On the vehicles of the second serie, there was no more radiator and the lateral destination indicators were larger. - The vehicles of the third serie had a more common appearance : the only lateral indicator destination was installed in the back side, over the seat of the conductor, and the mudguards were no more present. 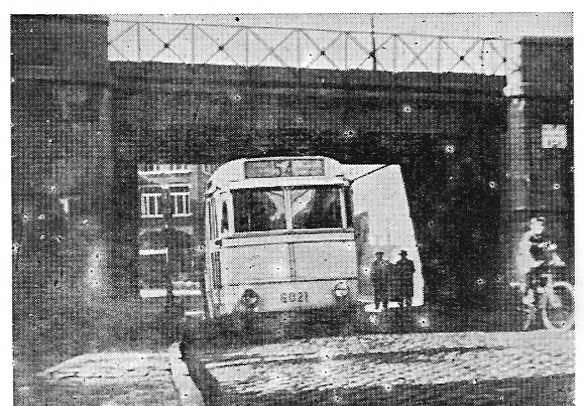 Trolleybus 6021 rides under the old narrow bridge at Forest-Est station, between 1946 and 1949. The trolleybuses of this serie were brought into service a short time after the Second World War. 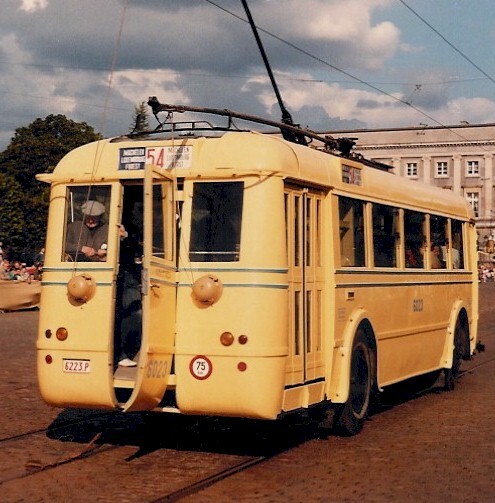 On this picture we can recognize the typical appearance of the brussels trolleybus, that were adapted later on the other vehicles. All the visible differences in all the series were little by little corrected and all trolleybuses were later homogeneous. - The last two vehicles were completely built in the STIB factories, who made the entire coachbuilding work. Length 10 metres, width 2,35 metres, wheelbase 4,85 metres, compound ACEC 67/171 motor of 107 CV, controller command to control the speed, rheostatic service- and air compressed brake , mechanic station brake. The inner side of the trolleybus is conform to the style of these times : 36 sitting places in 2 rows of 9 double seats, practically all sitting facing forward. There was 30 stand places too. After the Second World War and the installation of the conducteur seat, a one-way circulation was established in the vehicles, where the clients had to take on board through the back door and to set down through the front door. Trolleybus 6023 in all its splendour. 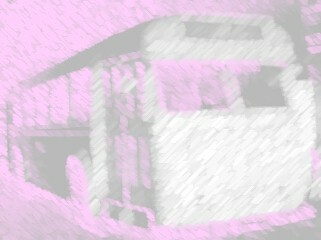 It was one of the last two vehicles builded in the STIB factories in the middle of the 50's. 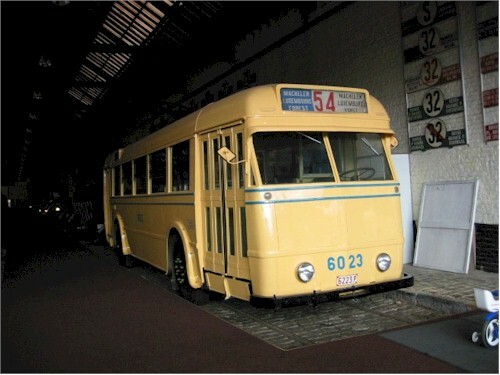 This trolleybus is conserved in the Brussels Urban Transport Museum. MTUB 3/3/2002. It must be noticed that the vehicle was equiped with a "carriage", an electric conductor that could fit in a tram rail. With this carriage the trolleybus could follow a tram road. For security reasons this system was not used during the service, but only when the vehicles rode back to the garage. An agent must care that the carriage was perfectly fitted in the rail. If this one left the rail, the vehicle lost its negative pole. Difficult points were of course the different crossings and switchings. And we won't forget that the last vehicles were equiped with accumulators, this vehicles could maneuver in different places where there was no trolley wire (for example, to turn and go back).